We spent the last few days of our time in Bali, in Kuta. This is a very built up, touristy place. It is known for it’s beaches, and many people come here to Surf. We enjoyed our time here, we were staying in a beautiful hotel, right by the beach, called Fat Yogi. We would definatley reccomend this hotel. We had a lovely large room, that was cleaned daily, with Air-Con, a pool, and breakfast was served to the room daily! We had no trouble with this hotel, and the staff were very friendly! Paul was working for a few days, whilst in Kuta, so we stayed still for those few days, and just enjoyed swimming in the pool and going to the beach. Kuta is mostly full of young people, wanting to party. A few days there was fine, but we found it a little over populated with tourists, and it didn’t really give us much of a taste for Bali. It was worth a short visit, but we much preffered our time in Ubud, and our visit to Mount Batur! We really enjoyed our time in Bali, and could of done with 3 weeks in total there, but we have plenty more places to see in the world, so we have to keep going! We went to leave our hotel at 3.15 am on the 20th March. We got to the exit of our hotel, to find that the gate was locked. Rather than waking up the staff, and getting the hassle of being told that we needed a guide, we decided to just jump over the gate. I guess the adventure started here. The walk to the foothill of Mount Batur, took about 25 minutes from Hotel Surya. We had our wind up torch ready with us, which we needed even just to walk along the dark road, leading to the foothill. Lucky it was a wind up torch, as if our batteries had gone, we would have been stuck! Just as we got to the foothill of the Volcano, a guide with a group came running up to us, saying, where are you going? I will go and take you to the Trekking office to pay for a guide. We replied by saying ‘where are you going?’ He finally got the message, that we did not want a guide. So the trek began. We started from the lake side of the mountain, opposite a small shop. The path was wide at the beginning, but got narrower as we climbed higher. It was hard with just one torch, so I would suggest everyone in your group takes a torch. We took the walk slowly in the dark, as we wanted to make sure we were sticking to the correct path at all times. Most of the time the path was clear, but at times there were a couple of ways to go, and in the dark it was hard to see which was the easiest path. Most of the time we were walking completely alone, but eventually a few groups with guides came up behind us. The guides kept asking, how many are in your group? We would reply, just us two. They were trying to get us to join their group. We are sure it is nice going with a group, and if you manage to find other travelers who want to climb with you, that would be a good idea. However we did not want the restriction of having a guide tell us, what time we had to leave and what time we had to start our descent down the volcano. Also most guides charge $35-$60 each. Which we felt was a monopoly, as this is much higher than the average wage in Bali. The first half of the walk was mostly flat, with just a slight gradient. When we got to the base of the mountain, it became much steeper and rockier. However, other than loosing breath at times, this part of the walk was safe and manageable for most people. We just needed to take our time on the rocks, making sure they were stable. So far we had both managed to stay of both feet. Just as we got close to the top, a guide in front, decided to try and be helpful by giving me his hand, to steady me. Funny thing is, this is the only time that I fell! The walk to the first peak took us around 1 ½ hours. This is where most guides take their groups to watch the sunrise. We decided to also stop here. Sunrise was around 6am. Watching the sunrise from the top of Mount Batur, was a beautiful experience, which I would recommend to everyone. Lucky for us the sky was clear, apart from a few clouds. So the view across the lake and mountains was amazing. Across the lake we could see Mount Abang and just behind that Mount Agung. We had to put our jackets on for the first time since being away, as the air was fairly cold up high. We sat for about 1 hour watching the sun slowly come up. This was such a peaceful experience. I will certainly always remember this moment! We decided to continue our walk up to the 2nd peak, at around 7am. This part of the walk is more difficult, but still safe. It is just one steep, sandy hill, upwards. I found it easier to let my feet sink one at a time, to give me some grip; otherwise I seemed to be getting no where. This part of the walk only takes around 10 minutes, however we had to stop a few times, to get our breath, as the hill was very steep. It was encouraging to hear the voice of a lady at the top, saying, you’re nearly at the here! We are so glad that we walked up to the 2nd peak, as this is where you see the Crater of the Volcano fully. You can also see volcanic steam, coming from the crater. We saw an egg cooking on one of the vents. You also have a 360 degree view of the surrounding area, where you can see, several volcanoes, the lake and even the ocean in the distance. We stopped here for a while, to just sit and take it in! After walking to the 2nd peak, there is the option to walk around the rim of the crater. The edge along the crater looked narrow and a lot harder. I decided I wasn’t up for walking around the crater, as I am not great with heights, and thought that I would not enjoy this part of the walk. Just when I had convinced Paul, that wasn’t going to walk around the rim, I saw a little American girl aged around 10 years old, who inspired me to keep going. She dragged her Mum along, saying, look lets walk around there, it looks awesome. She was right it did look ‘awesome’; I was just letting my fear stop me. So I said energetically ‘Ok, let’s continue’! So we continued the walk. At first it didn’t seem so hard, but as we got to the middle of the rim, the path became very narrow and there were no longer any edges to hold onto. This is when I started to wander, what the heck I was doing out here! Paul kept encouraging me, which helped a lot. I finally pulled myself together, and continued. It was important that I stayed confident, as it was when I was scared, that I would loose my balance. Once I became more confident, I started to enjoy the walk much more. It was definitely worth it! We made sure we stopped plenty times, to take the view in, as it is hard to appreciate it, whilst walking, with shear drops, at both sides of you. Even though we didn’t have a guide with us, we were not alone. A small dog followed us all along the rim of the crater. How he got up there I do not know. He became our little guide, making sure we got down ok. Although at times, he got in our way, as he kept walking under our feet, making us trip over. The hardest bit of the walk was the descent down the rim of the crater. This was just a sandy hill, so it was very hard to stop. It would of been easier to slide down! We got back down to the foothill of Mount Batur, around 12pm. We were the only ones up there at this point, as everyone else had been taken down with their guides. We are very glad we didn’t get a guide, as we would not of seen half of what we saw. Walking up Mount Batur, was amazing, and if you are in Bali, I would highly recommend you to walk up. You do not need a guide, but if you are alone, I would suggest that the company would be good! We left Ubud on Saturday 20th March. We were picked up by a driver from the Surya Hotel, in Kedisan, where we were heading. This was a free pick up, included in the hotel price. The journey from Ubud to Kedisan was about 1 hour. The driver kept trying to get us to go to places on the way, to get money out of us. We kept saying no, just take us to our hotel, but he kept on asking! As we got closer to our hotel, we started to ascend up hill, so I assumed we would be staying up high. Then just as we got close, we went down a very steep, winding hill, that took us down to a lake, surrounded by volcanoes and mountains. The whole area is a feature of volcanic eruptions called a caldera.The larger caldera is 10km by 13km and was formed 28,500 years ago and the inner caldera which is 7.5km wide was formed 23,670 years ago and now contains lake Batur. When we arrived in our hotel our driver continued to ask if we wanted to be taken places later, we kept telling him no, but I don’t think he understood! We were met by a member of staff from the hotel and taken to our room. We had asked for a standard room, which costs $10 a night for both of us. When we went to pay, the man charged us $15 dollars a night, I didn’t realise until I went back to my room, so I went back to enquire about it. He told me that the room we were staying in cost that much. So I explained that we asked for a standard room, which according to the website cost $10 a night. He just kept saying this is the price my manager told me. We were finally shown another room, which they said was the standard room for $10 a night. It only had cold water, even though the website states that all rooms come with hot and cold water. We were ready to leave and find another hotel, until the guy told us we could have the original room for $10 instead of $15, so long as we didn’t tell any of the other guests. Maybe the information on their website needs to be changed, to stop more confusion in the future! We had planned on staying in the hotel for 3 nights, but left after the second night. The rooms were not clean, the toilet didn’t flush, there was no fan in the room and there were bugs everywhere. We were also sick of being sold things every 5 seconds. It was either a knock on the door trying to sell us art, or whilst tringto sit and relax in the bar, we were being told that we must come on the trek up the mountain with them, for $35 dollars each. This hotel is fantastic for location, as it is only 30 mintues walk from the foothill of Mount Batur, but other than it having a great location, I would not recommend it. There are a few other hotels in the area, so it may be worth looking around. After we finally settled in our room on the Saturday, we went for a walk around the tiny village of Kedisan. We also walked to Pura Yati, another village close by. There isn’t many restaurants or shops around the area, and I didn’t see any cash machines, so take cash with you. We finally found a small cafe, so we decided to stop for something to eat. There wasn’t much choice on the menu, we just decided to get some frys each and some garlic bread. The garlic bread was very interesting. It was two slices of buttered bread sandwiched together. We took the top slice of bread off, to find cloves of chopped garlic spead over it. Well I guess they took the name ‘garlic bread’ litterally. Just before we left the cafe, we asked the lady where we could start the trek up Mount Batur. Everyone keeps telling us that we must go with a guide and the guides are charging between $35 and $60 each. We found out from research on the internet, that this is not true, and that the locals just say that to make money. The lady in the cafe, kindly told us where we could start the trek. She also warned us about guides trying to tell us that we needed a guide. She said just say you are just looking, if they ask. 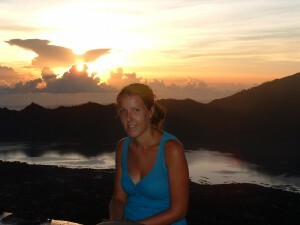 We decided we would do the Trek up mount Batur the next morning. Leaving at 3 am to arrive at the top in time to see the sunrise. 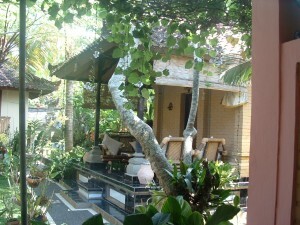 We arrived in Ubud on the 17th March and stayed till the 20th. We really liked Ubud and would definatley reccommend anyone coming to Bali, to spend a few days here. 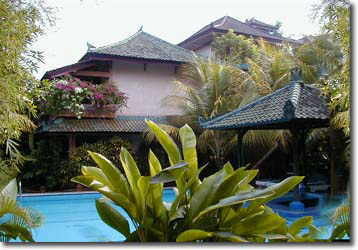 We stayed in Teba House, near the center of Ubud. The gardens here were beautiful and the staff were very friendly and helpful, they did not hassle us at all! Breakfast was included, and was brought to our porch every morning. We would definatley stay here again. We also went to watch an amazing performance. This was a traditional dance in Bali, called the Kecak and firedance. You can watch these performances daily around Ubud and it costs around 75,000 IDR each. It is well worth seeing. Click here to view our video’s. There were so many music shops in Ubud, I bought a couple of small indonesian instruments, I would of liked to buy more, however I can’t carry them all the way around the world with us! My ukulele is still with me and I practice most days, but miss my guitar, it is not the same! I may buy a cheap guitar once we get to Thailand. Hindu New year, otherwise known as Nyepi Day, was a relaxing and peaceful day. The whole of Bali goes silent for this day, and this is taken very seriousy! The police patrol the streets, making sure no one goes out. Everyone must stay in their homes, and tourists must stay in their hotels. We were able to go and sit down by our pool, so we chatted with the other guests in the hotel. I was prepared to have a day of silence, even though I would struggle, however all the guests were talking to eachother. So we swam and talked all day. It was weird looking out onto the street and not seeing a single person in sight. In the evening the sky looked amazing, as there were no street lights disturbing the night sky! It was nice seeing everyone follow in this tradition! The night before New Year locals make these Ogoh Ogoh statues and parade them around the streets. The streets were packed with tourists, who came to visit to see this event. Check out our youtube video’s to see the Ogoh Ogoh on Parade .